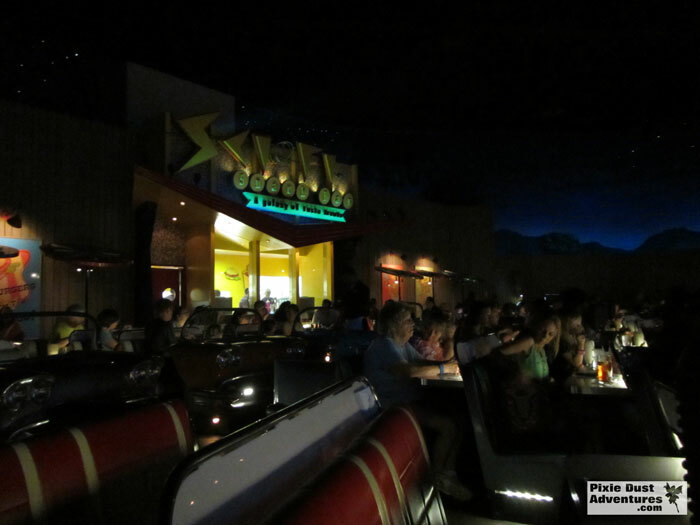 The Sci-Fi Dine-In Theater Restaurant in Hollywood Studios is one of my family’s favorite restaurants in Hollywood Studios. 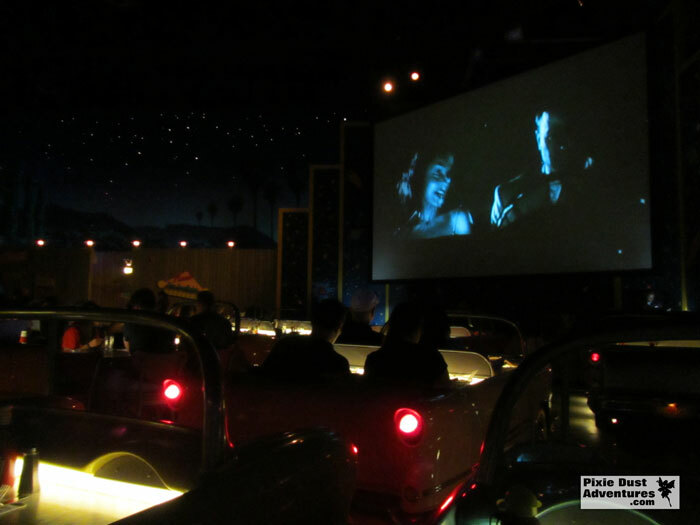 The atmosphere is unlike any other as you are seated in a classic 1950’s car table while you watch black and white movie clips from movies like Godzilla. This table service restaurant is a must-see and is on the Disney Dining Plan. Lets start with 4 tips and end with the news of breakfast being served. 1. 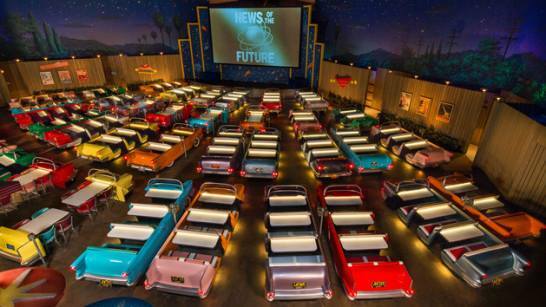 Dine while watching old time movies: As you are guided to your car table by a your car-hop, take in the details of this one-of-a-kind restaurant. There are stars shining overhead as the car lights glow. Watch old movies that are enjoyable & entertaining, but are only clips and you will see the same clips more than once if you eat slow enough. 2. Request a Car automo-booth: Some table are just tables with regular chairs around them & a booth on one side of the car. The preferred tables have 3 bench seats, with tables in front of each seat for your food. Each bench seat can fit 2, so only 6 people will fit in a single car automo-booth. If you are a party of 4, you may pick up some hitchhikers along the way… By requesting one of these popular car booths, your weight may be slightly longer. 3. 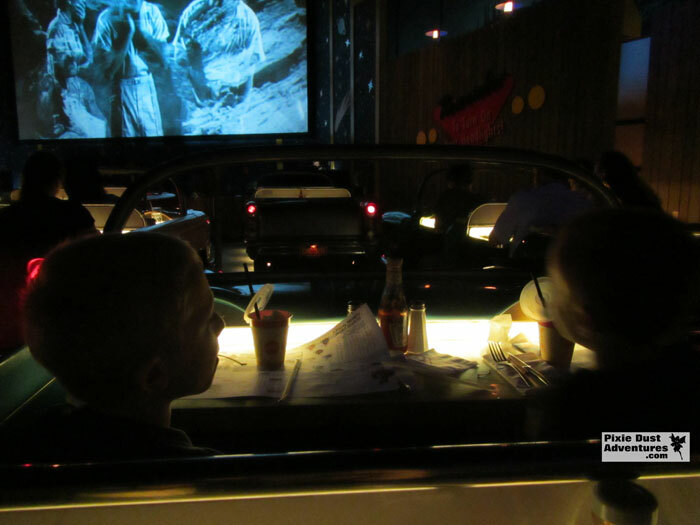 Try a milkshake: Be sure not to miss the old fashioned milk shakes served at the Sci-Fi Dine-In the Oreo Cookie is my favorite! if you are on the Disney Dining Plan, you can order water to drink & swap your drink for a milkshake & still be able to order dessert with your meal. 4. Don’t miss dessert: Even though it is tempting to order a milkshake with your meal & then skip dessert, you must try at least one dessert to share. I recommend the House-made Sci-fi Candy Bar or the Out-of-this-World Turtle Cheesecake. These unique desserts look as good as they taste. This experience is available for a limited time and is in addition to the regular lunch and dinner offerings. The price for breakfast is $23.99 per adult and $12.99 per child age 3 to 9 (tax and gratuity not included). 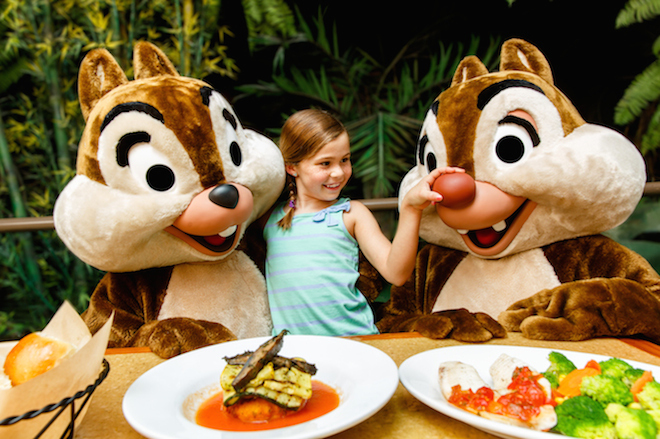 Meals are one table-service entitlement on the Disney Dining Plan. 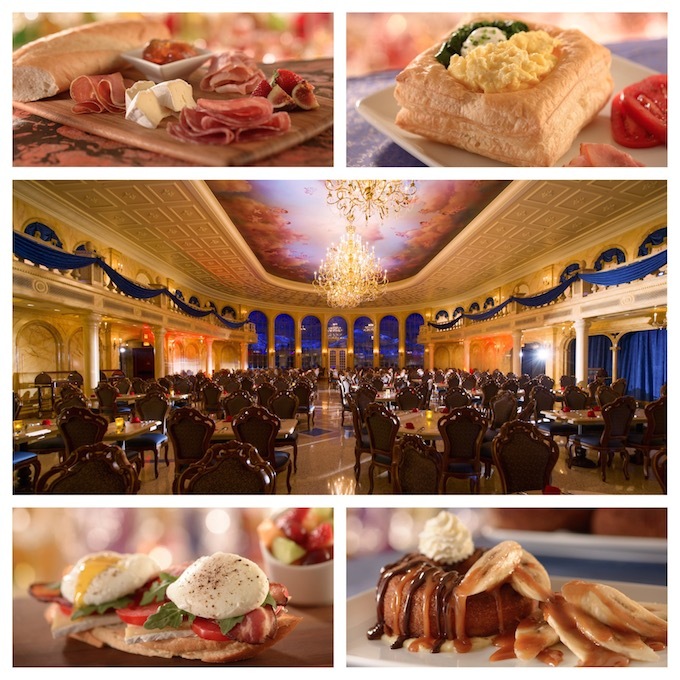 With the successful test of the fast casual breakfast experience at Be Our Guest Restaurant in Magic Kingdom® Park at Walt Disney World® Resort, they have announced this as a permanent offering. For two meals a day Be Our Guest requires only quick service dining credits and because of this, it is easy to see why Be Our Guest has become such a popular restaurant for breakfast & lunch reservations. Dinner reservations are also available, but do demand table service dining credits. The prix fixe French-inspired breakfast menu includes pastries, cured meats and cheeses, eggs Florentine, vegetable quiche, and more. Plus, you can indulge in the Croissant Doughnut, a fried doughnut topped with banana caramel sauce, chocolate ganache and whipped cream. Younger Guests can enjoy brioche French toast, scrambled eggs, fruit crepes, as well as cereal and oatmeal. Breakfast will be served 8-10 a.m. daily. Pricing will be $21.99 plus tax for adults, $13.99 plus tax for children ages 3-9 years. Reservations will be available beginning Aug. 5, 2015 for dates Oct. 4, 2015 and beyond via My Disney Experience, or by calling 407-WDW-DINE. Advance reservations are encouraged. The Disney Dining Plan will be accepted. As most people know, you can now make dining reservations for the quick service, lunch the newest and most popular restaurant in Disney World, Be Our Guest. Because of the successful launch of the lunch experience, they are now going to be testing a fast casual breakfast offering. This test will take place from march 20th – June 18th 2015. During this period, a prix fixe breakfast will be offered from 8am to 10am daily. The meal will be a French-inspired menu including pastries, cured meats and cheeses, eggs Florentine, vegetable quiche. Not to mention the sweet offerings such as Croissant Doughnuts, fried doughnuts topped with banana caramel sauce, chocolate ganache and whipped cream. Younger guests can enjoy brioche French toast, scrambled eggs, fruit crepes, as well as cereal and oatmeal. 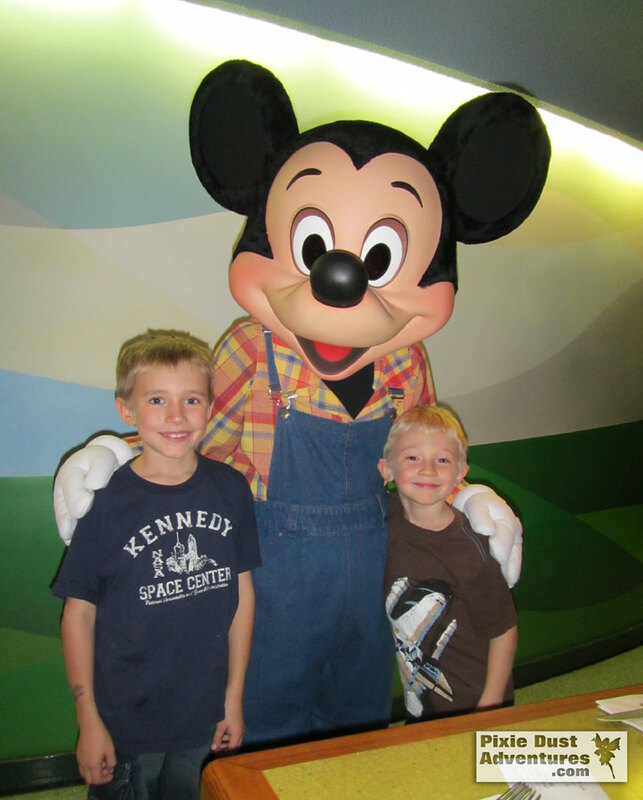 Reservations begin on March 17th, 2015 for dates March 20th – June 18th 2015 via My Disney Experience, or by calling 407-WDW-DINE. Advance reservations are strongly encouraged. The Disney Dining Plans will be accepted.